10. Kansas (14–3): The Jayhawks are coming off an 86–81 loss at Iowa State, but with non-conference wins over Florida, Michigan State, Georgetown, and Utah they still have a good résumé. In addition forward Perry Ellis put up 19 points and 11 rebounds against the Cyclones—a great sign for KU and the struggling-Ellis. This week: versus Oklahoma (Monday), at Texas (Saturday). 9. Iowa State (13–3): The Cyclones got an early lead against KU and never let up Saturday. One thing that caught KU by surprise was their secondary break. Fred Hoiberg’s team beat Kansas down the floor—even after made baskets by the Jayhawks—for easy buckets multiple times in the win. This week: versus Kansas State (Tuesday), at Texas Tech (Saturday). 8. Wisconsin (16–2): Frank Kaminsky was back Thursday in the team’s 70–55 win over Nebraska after missing the Rutgers game with a concussion—a game they lost. The Badgers sorely missed the 7-footer who has scored in double-digits in all but one game this season and leads the team in points (17.2) and rebounds per game (8.0). This week: versus Iowa (Tuesday), at Michigan (Saturday). 7. Duke (15–2): After back-to-back double-digit losses Duke bounced back in a big way with a win at Louisville. Freshman Jahlil Okafor put up 18 points and seven rebounds in the impressive win as the Blue Devils held Rick Pitino’s squad to just 29.5 percent shooting—in Louisville. This week: versus Pittsburgh (Monday), at St. John’s (Sunday). 6. Notre Dame (17–2): While a number of teams on this list win with defense, the Fighting Irish are able to out-score their opponents. Notre Dame is second in the country in shooting at 52.8 percent, while the team averages 81.7 points per game—good for 12th in the nation. This week: at Virginia Tech (Thursday), at N.C. State (Sunday). 5. Arizona (16–2): The Wildcats are another team led by a freshman as forward Stanley Johnson paces the team in both points (14.6) and rebounds (6.8) per game. Arizona, which is tied for the Pac-12 lead, have lost their two games by a total of just 6 points and boast a 15.5 point scoring margin for the season. This week: at Stanford (Thursday), at California (Saturday). 4. Villanova (17–1): Jay Wright’s club is having a special season. He has a balanced team with five players averaging double-digits in scoring, though only one is putting up more than 11 per contest—senior guard Darrun Hilliard II. This week: at Georgetown (Monday), versus Creighton (Sunday). 3. 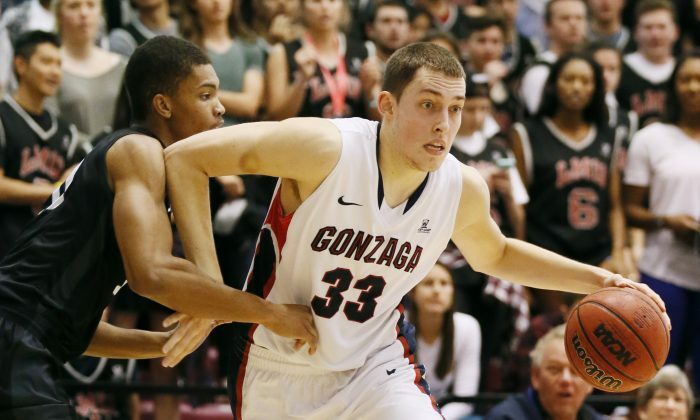 Gonzaga (18–1): The Bulldogs have won 11 straight since an overtime loss at Arizona in early December and they probably won’t be favored to lose again until March Madness is here. With arguably their toughest contests remaining coming against St. Mary’s, Gonzaga should cruise into the Big Dance as conference champs. This week: versus St. Mary’s (Thursday), versus Pacific (Saturday). 2. Virginia (17–0): The undefeated Cavaliers, who are second in the country in fewest points allowed at 50.6 per game, have won all but three of their contests by 10 points or more. Only Miami, which has had a roller-coaster season even took them to overtime. This week: versus Georgia Tech (Thursday), at Virginia Tech (Sunday). 1. Kentucky (17–0): After a pair of lackluster wins over Texas A&M and Ole Miss, Kentucky is officially back. The Wildcats thrashed Missouri by 49 and then Alabama by 22 this past week to erase any doubts as to who’s No. 1. John Calipari’s dream team leads the country in scoring defense at 50.4 points a game and has embarrassed top programs like Kansas (72–40) and UCLA (83–44) along the way. This week: versus Vanderbilt (Tuesday), at South Carolina (Saturday).